Not far off the coast of Tobago lies a smaller, even more intensely green island, Little Tobago. 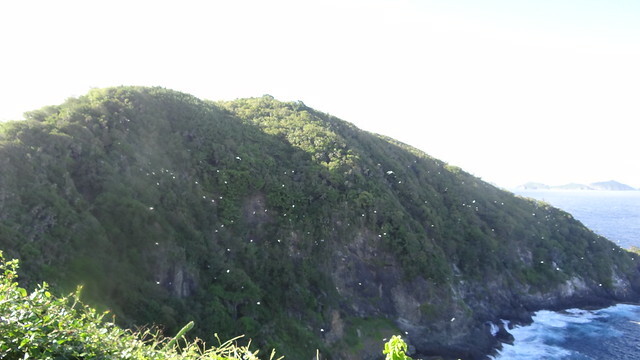 Even from the shores of Tobago, eager eyes can pick out the swirling white dots that can mean only thing: Tropicbirds. 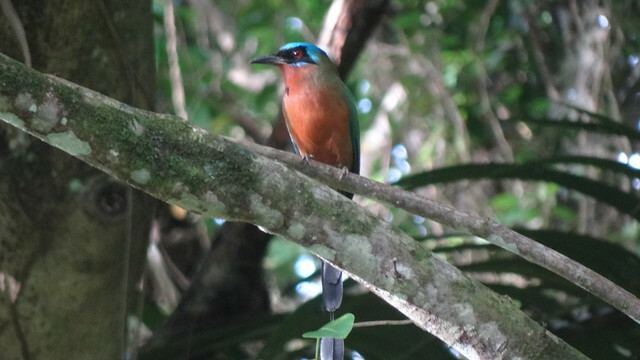 Of all the many things to look forward to on last month’s visit to Trinidad and Tobago, I anticipated none more eagerly than the chance to finally see my first wild phaethontids, like bright white feathered suns against a tropical sky. 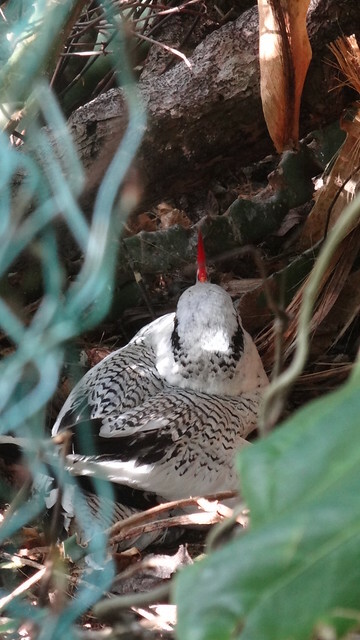 The Red-billed Tropicbirds of Little Tobago were busy indeed during our visit, hunting the open sea and flying in and out of their nesting cliffs — all the while working hard to avoid the depredations of the sinister-looking Magnificent Frigatebirds. 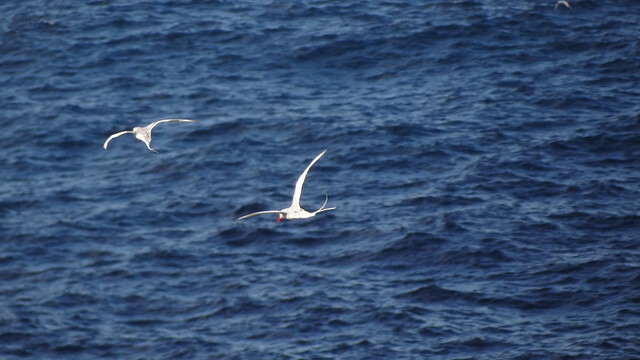 The frigates were remarkably good at hazing the tropicbirds into dropping their meal. 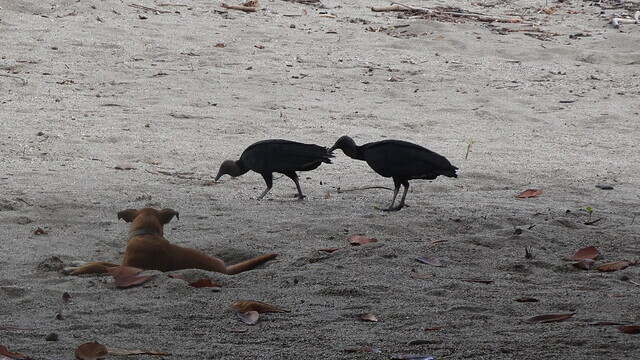 The most dramatic episode was when a frigatebird swooped in to grab a tropicbird by the long tail; for several seconds, the pirate twisted the smaller bird’s feathers until finally it defecated — and the frigatebird dropped to partake of the stream in flight. Not overly appetizing, but still something no birder would want to have missed. 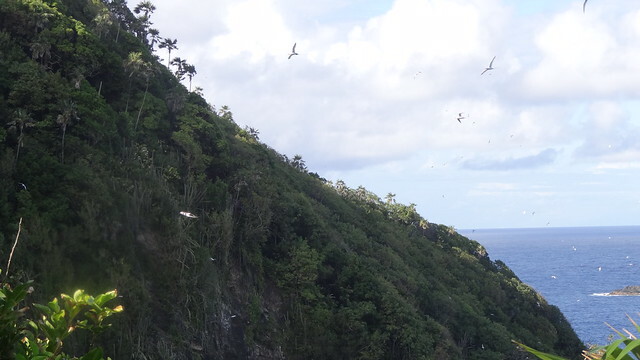 With so much bustle everywhere, it was obvious that the tropicbirds were in fact breeding, an assumption quickly borne out by the discovery of incubating birds right at our chosen overlook. This individual was sufficiently nonplussed as to get up and turn its back to us, but the others simply faced us down, confident, I suppose, in the intimidation factor provided by that sharp, blood-red bill. Only a frigatebird would mess with a face like that. Sheer luck. 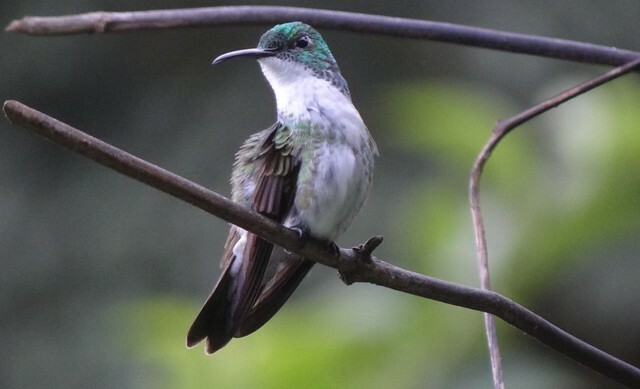 Somehow over the years I’ve managed to wind up in some of the best hummingbird spots on earth, from the Huachucas of southeast Arizona to the Andean cloud forests of Ecuador (and not to forget Gibsons, British Columbia, either). With only seventeen species on the country’s list — the same number boasted, I think, by New Mexico — Trinidad and Tobago doesn’t really make the short list when it comes to trochilid diversity. But if the variety is only so-so, the abundance of birds at some sites has to be seen to be believed. 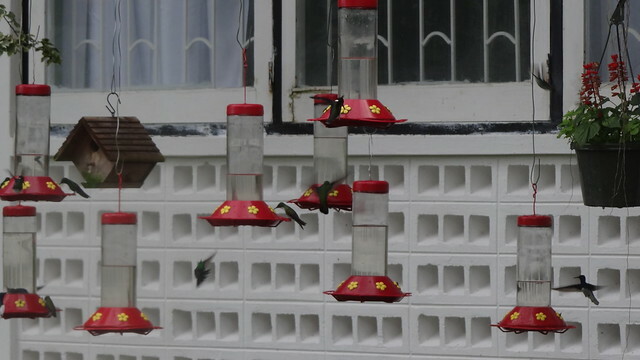 In a set-up familiar to anyone who’s birded the canyon resorts of southeast Arizona, long lines of hummingbird feeders hang from Newton George’s porch on Tobago. And from poles in the yard. And from the roof of the house. Each of those little green-black smudges is a perched hummingbird — most of them Copper-rumped Hummingbirds — awaiting its turn at the sugar water. 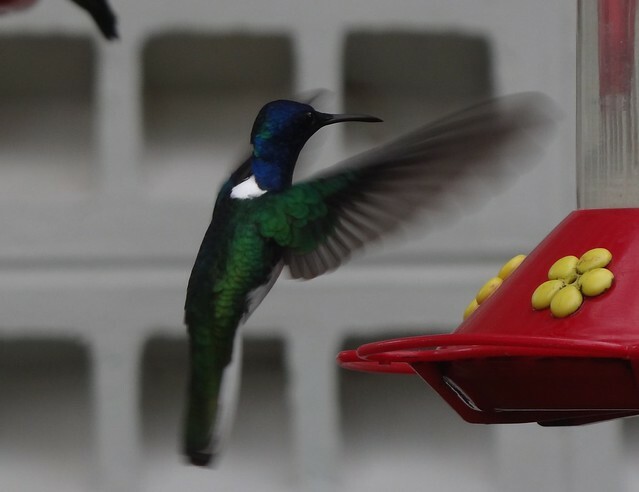 The prize species here is the Ruby Topaz, a bird with the infamous distinction of having been “harvested” in greater numbers than any other during the hummingbird crazes of the nineteenth century. Happily, this big, dark, gloriously colorful hummingbird seems to be as common as ever. The much less abundant White-tailed Sabrewing also visits Newton’s feeders, though on this trip we had to content ourselves with birds in the wild of Tobago’s forests, including a female on a nest within earshot of a male singing his chirping, chipping song. 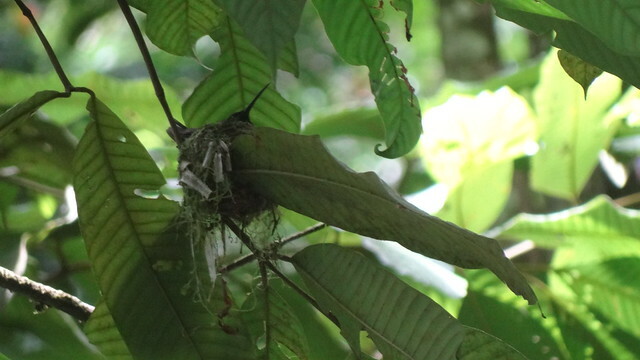 Back on Trinidad, we dropped in on several fine hummingbird localities, including, naturally, the feeders at Asa Wright Nature Center. 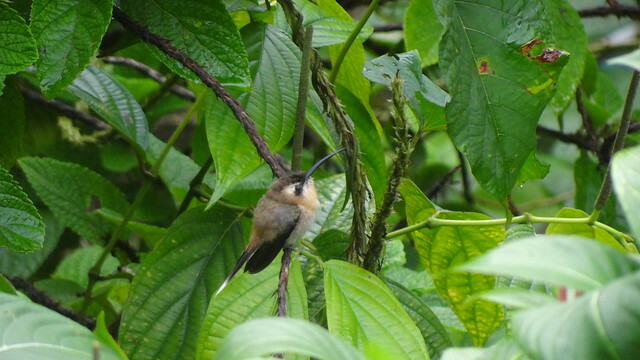 The Little Hermit, depending on your taxonomic views, is a common and familiar hummingbird throughout the tropics, but this one, perched just off the porch at Asa Wright, gave me something I don’t think I’d ever experienced before: long views of a sleeping hummingbird, motionless on its twig with the eyelids firmly closed. 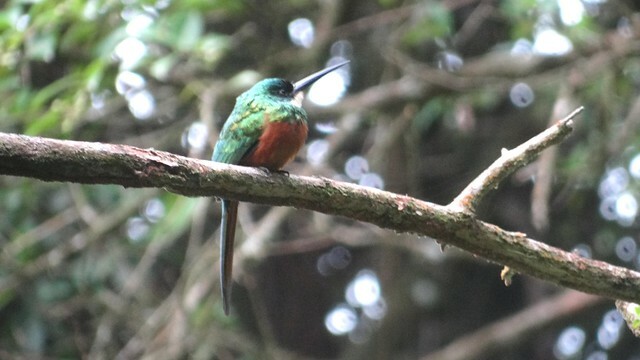 Asa Wright was also one of several places where we had good looks at the bizarrely ornamented, weirdly insect-like Tufted Coquette. We saw only a few birds in full male plumage, which were greatly outnumbered by female-like individuals feeding in slow, tight circles in the verbena patches. 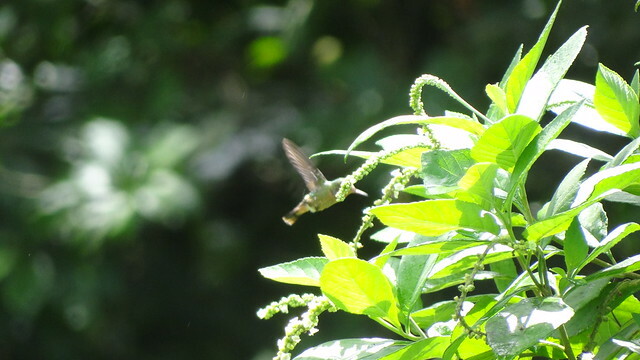 The busiest place for hummingbirds on Trinidad, though, is Yerette. 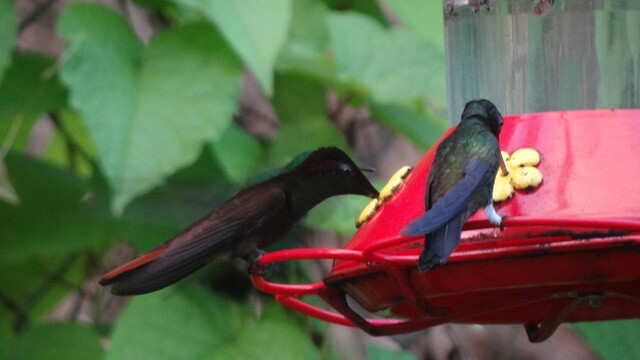 We had the best of both worlds there: food and feeders alike, an excellent lunch and equally excellent hummingbirds. 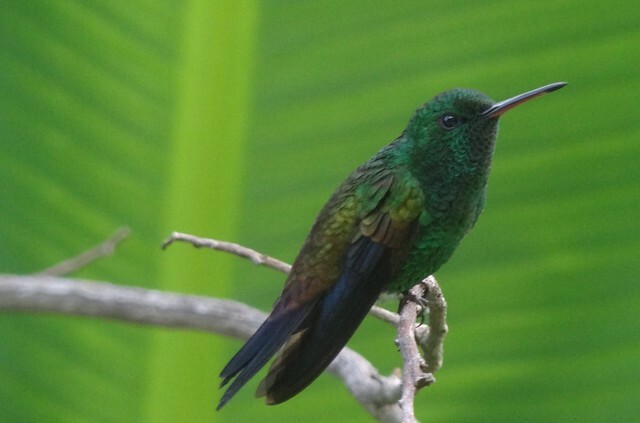 It was here that we finally caught up with the Green-throated Mango, our fifteenth hummingbird species for the week. The sheer number of individual birds was nearly overwhelming, but somehow we managed. And I think we’ll rise to the occasion on our next visit, too. 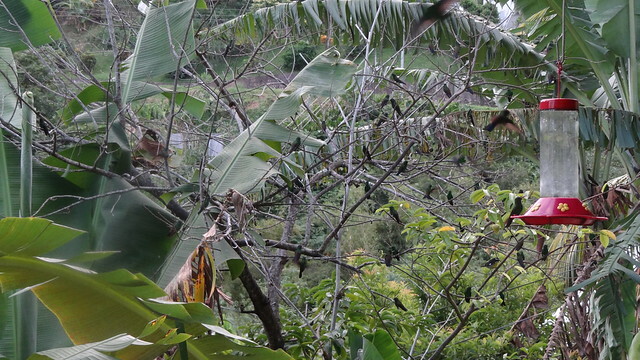 Can you figure out which two of Trinidad and Tobago’s hummingbird species we did not see? It can be hard enough to figure out how we know what we know. But it’s almost impossible to retrace the byzantine mental wanderings that made us think what we once thought. 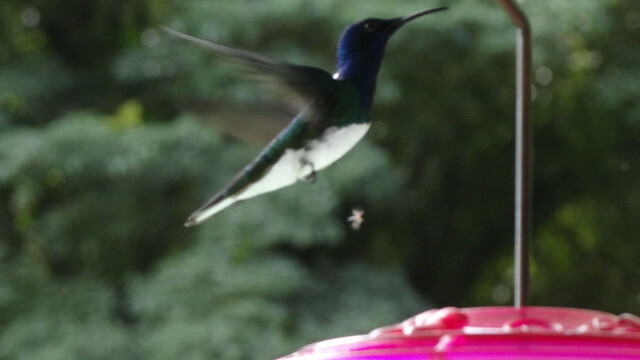 Somehow, when I was in junior high, I managed to tangle up what little I knew about the French Revolution (then not long past) with what little I knew about hummingbirds, and convinced myself, or let myself be convinced, that the dazzling White-necked Jacobin had taken its odd name from the faction that seized power in the Convention in spring of 1793 — and from the bright slash across the nape, white in the big hummingbird but tending rather to the scarlet in Robespierre and his gang. Nonsense. Spun from whole cloth, all of it. The Friends of the Constitution just happened to meet in a former convent in the rue St-Jacques, and the bird just happens to have a hooded appearance recalling the cowled habit worn by the Jacobin Dominicans of eighteenth-century France. the Colours in this Bird, as in most of this Kind, seem to be mixed with fine golden Threads, which make the whole Bird appear very splendid, when exposed to the Sun-beams. 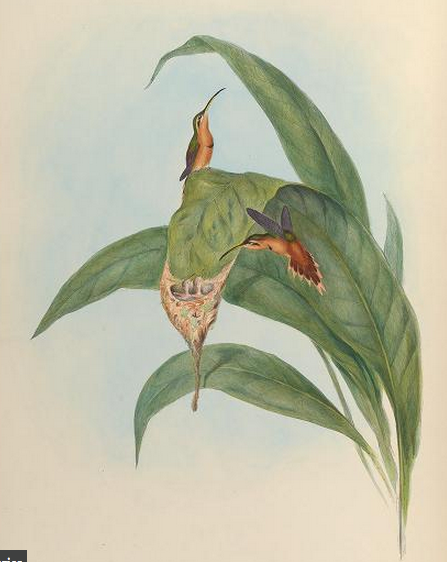 Edwards’s no-nonsense, descriptive name was taken over by John Latham, who used it for forty years, including the White-bellied Humming-Bird in both the General Synopsis of 1782 and his 1822 General History. 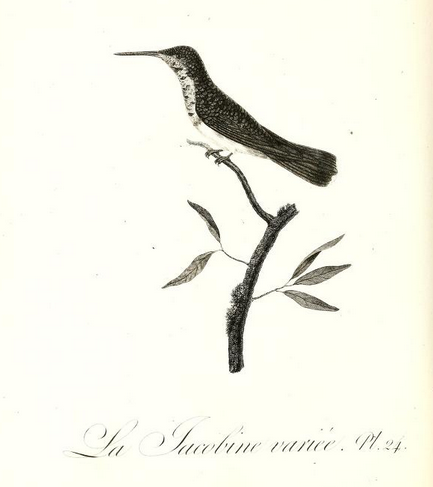 Latham also includes accounts of the “Spotted” or “Spotted-necked” hummingbird, based on the “colibri piqueté” of Brisson: by the time he came to write the General History, however, Latham could inform his reader that other ornithologists (most notably Audebert and Vieillot) had tentatively identified this and other “varieties” as the females or young of the White-bellied. This was not the first and would not be the last time that ornithology put asunder what God had joined together. 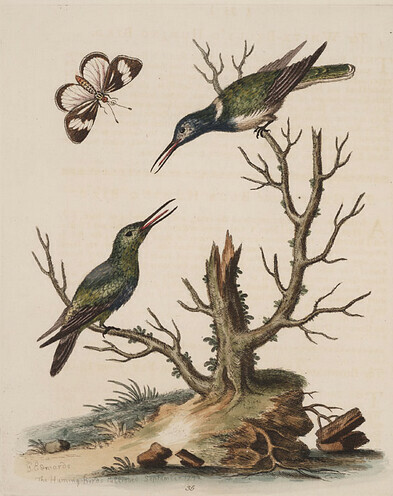 George Shaw, meanwhile, in the unjustly ignored General Zoology, took his nomenclatural cues from Brisson, rendering the French ornithologist’s “oiseau-mouche à collier” as the White-collared Hummingbird. William Jardine, too, adopted that very appropriate and very dull name for what was in its day probably the most-read English-language book on the trochilids. It is, obviously, the distribution of white in the bird’s plumage that gave rise to the idea of calling it Jacobine. 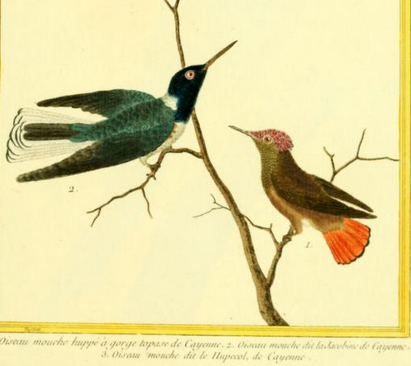 No surprise, of course, that an English hummingbird name should have its origin in a French hummingbird name. But look close: the French name is feminine, referring not to the Dominican monks of St-Jacques but to their female counterparts. In the French onomastic tradition, this brightly colored male hummingbird is named for the resemblance of its plumage to the habit of a nun. 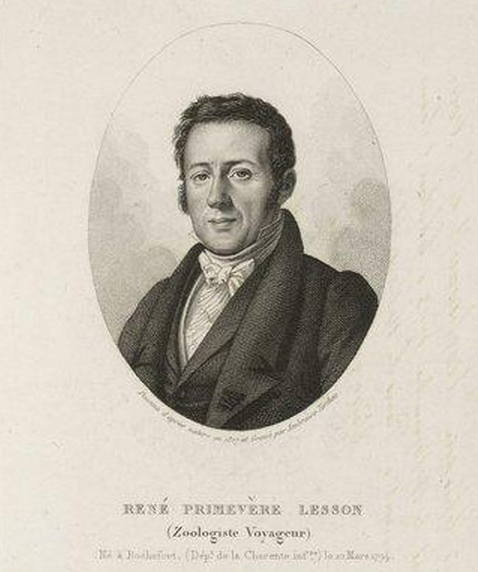 as did Lesson in his Trochilidées, in the Traité d’ornithologie, and, in greatest detail, in the Compléments de Buffon, where this most prolific of trochidologists reviews the “variants” of “la jacobine” that over the years had been classed as distinct species. the terms Jacobin and Dominican [are] applied as epithets to pied birds whose plumage mirrored the black and white vestments, hoods and cloaks of the Jacobin or Dominican friars. It’s not as good a story as the wild and ignorant imaginings of childhood, and in the case of the hummingbird, it’s not quite right, either. Next time someone tells you the bird is named for a monk, you can gently correct them. And if you want, you can join me in calling them jacobinesses. 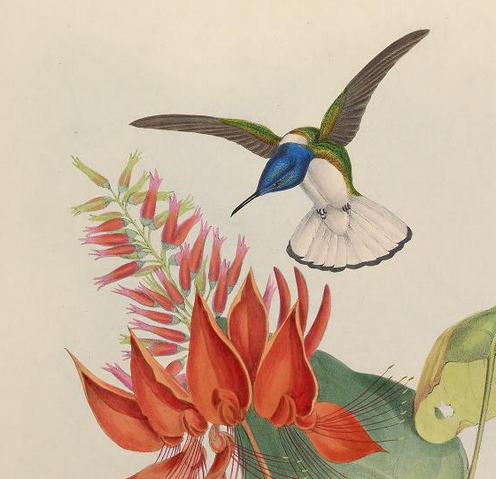 I knew in advance how this one was going to work out: the OED would lead me to the earliest citations for the English hummingbird label “hermit,” and a little bit of e-drudgery would let me push the name back to its apparent source, probably among the French trochilidistes of the early nineteenth century. And along the way, perhaps I would find an unexpected motivation for the now opaque metaphor that compares these birds to the early desert ascetics. That, after all, is how scholarship works — even when it comes to so trivial a question as that and so ephemeral a medium as this. frequenting the darkest and most retired parts of the forest … affecting dark and gloomy situations. in Brazil. And just who were those collectors? The residents of many parts of Brazil employ their slaves in collection, skinning, and preserving them for the European market; and many thousands are annually sent from Rio de Janeiro, Bahia, and Pernambuco. also supply the inmates of the convents with many of the more richly coloured species for the manufacture of artificial-feather flowers. 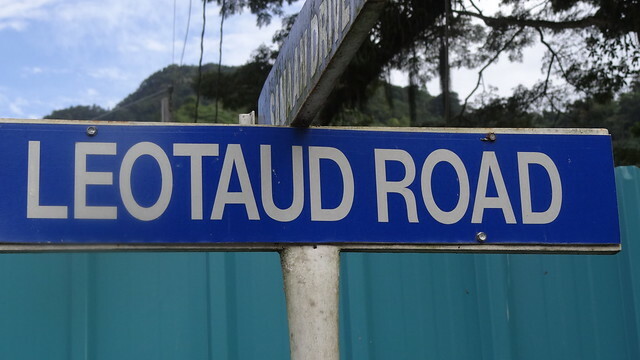 On his long journey through the West Indies in 1888, the Canadian cleric Léon Provancher attended a reception in Trinidad at the home of the eccentric Sylvester Devenish, where he made the acquaintance of Dr. Léotaud, “an island celebrity of whom I had already heard,” and his son-in-law, also a physician. Provancher, fully absorbed in his host’s collections of engravings, bronzes, photographs, relics, and “ornaments of all kinds,” has no more to say about the medical men in attendance, but I want to believe that they were relatives of an even more celebrated Trinidadian, Antoine Léotaud, author of what remains nearly 150 years after its publication one of the best and most ambitious, if necessarily imperfect, neotropical ornithologies ever written. I don’t know whether it is poor health, frustration at his lack of scientific resources, or a literary tristesse tropicale that is to blame for the striking tone of disappointed nostalgia that Léotaud affects in the Oiseaux. It would be the most offensive of positivisms to draw conclusions about Léotaud’s “real life” from the attitudes he strikes in his writings. But consider the fact that in 1865, while he was hard at work on the ornithology, Léotaud was awarded the gold medal of the Medical Society of Ghent for a study entitled “Sur les causes de dépérissement des familles européennes aux Antilles” — on the sources of degeneration in European families in the Antilles. 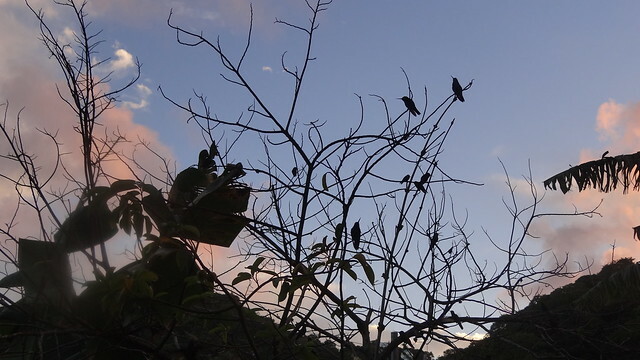 Whatever Léotaud’s own state, he had some pronounced ideas about the emotional and intellectual condition of the wild birds of Trinidad. destitute of gracefulness, revealing the bird’s insignificance; even its anger results in nothing more than an exhaled grunt which evinces its stupidity; its quarrels, lacking in energy of any kind, bear the sign of weakness…. Even in the pleasures of love it exhibits those sad characteristics that it reveals in everything else; it is silent, it is clumsy, its preparations are tedious and only with great effort does it manage to accomplish that act that is normally so effortless in almost all birds. Projection? Pathetic fallacy? Or just a bad mood? 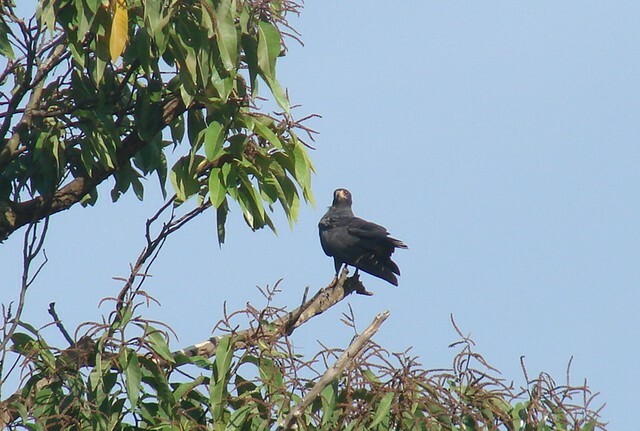 Léotaud writes with greater sympathy of the Snail Kite (the photograph here is from the South American continent — we did not see the species on our visit to Trinidad and Tobago). 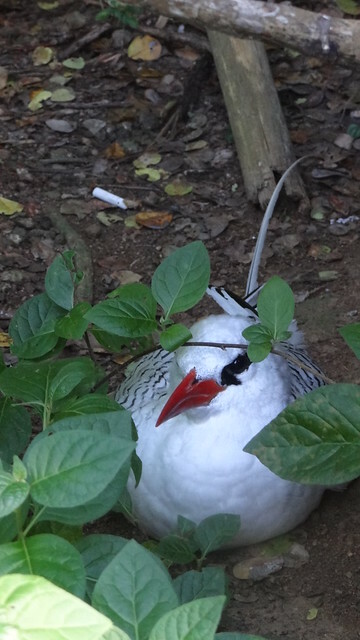 This bird is rarely seen here…. It is always alone, no doubt because it finds no companions…. only a few individuals come to visit us around the month of July, and thus they find themselves in conditions contrary to their usual habits. inspires sadness, as this bird is heard only when everything in nature is ready for slumber; its song ushers in the dusk. No doubt he is calling his companion in this way…. He prefers the dimness of our forests, which seems to suit so well the sluggishness of his movements and the sadness of his call. Having perched for a long time on a branch, he leaves it only with reluctance. Even the fires of love can barely raise him above his apathy. His call … is in no way meaningful; it is a call not of gaiety, or of anger, or of passion. And beyond that, his posture is heavy, his shape graceless… he draws attention only with his tail, [the shape of] which is one of those secrets that man will no doubt never manage to unravel. The female accompanies him almost always, but she is incapable of bringing animation to his so sad life. he remains immobile for hours at a time, and hardly stretches out his beak to grab an insect that happens to stray within his reach…. His call is weak and plaintive…. His companion follows him almost always to share this life that seems so sad and monotonous. 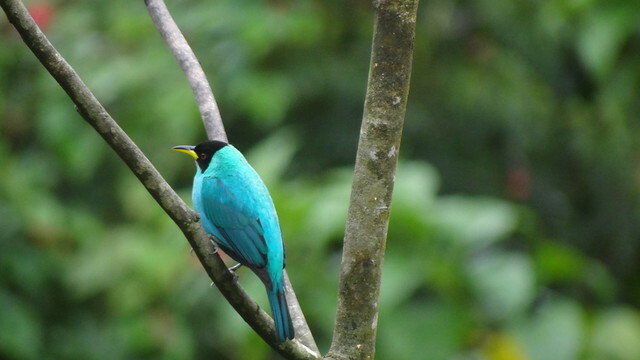 The most poignant case of all seems to be that of the Green Honeycreeper. Its form is not very graceful, and its posture is somewhat heavy…. Its plumage is worthy of admiration, but its weak, insignificant call draws no notice. He is not made for captivity, and deprived of his liberty, he soon converts his cage into a tomb. Nevertheless one can accustom him to his prison, but only at the cost of so much effort and patience that it is a triumph of which only some people are capable, namely those whose interest in birds is a true passion. It is harder and harder not to imagine that the author is speaking of himself and his own circumstances in such descriptions.